I was born and raised in Los Angles, California. Every year when our family would go on summer vacations to a nearby mountain lake, I would stand at its shore and wish with all my heart that I didn’t have to go home and could live there when I grew up. In 1992, my husband and I arrived on Orcas, leaving the city far behind. Little could I have imagined that dreams do come true, and often even better than you might have asked for. Orcas is a gentle place of extraordinary beauty, not only in land, but in people and heart. I found here not only a home, but a new family – an inspiring collective of artists called the Artworks Gallery, where characters are the norm, humor is frequent, spirits run deep and kindness and fun are fact. I have collected and created jewelry since childhood, but didn’t seriously begin to design and produce until 1993 when I first joined this gallery. What I make has evolved over time, although I have always tried to create with a specific purpose. 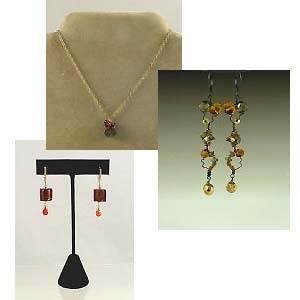 I love jewelry that looks elegant and is versatile. I strive to create pieces that look like expensive fine jewelry, but are more affordable. I see my designs as adornment – focused to enhance the wearer’s beauty, not distract from it. I am happily mesmerized by the opportunity that this medium provides in exploring colors, textures and shapes.